Add a touch of luxury to your bedroom decor with these satin shams. These shams showcases a pleated design. Take your pick from two sizing options, and give your standard- or king-size pillows an elegant, refined look within moments. Opt for this two-piece set in an ivory or mocha hue for a neutral decor upgrade, or select a rich golden color to warm up your setting. Opt for the darker plum shade to create contrast and add vibrant color to your room. 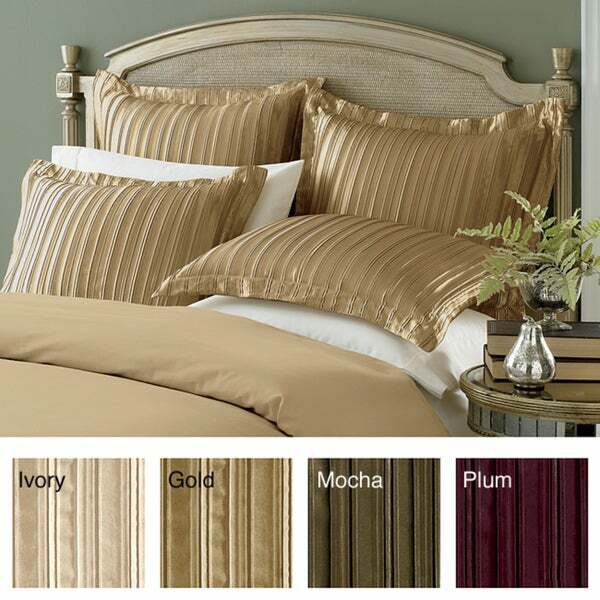 Gold satin pillow shams fabric is so beautifully elegant, unfortunately the borders flop and do nothing for the overall look of the bedding. Wish I could take a pic and post. Unless you know how to make the edges stand out, I would pass. It is satin so I am afraid to use starch. Do purchase the bed skirt, it is beautiful and put the final touch on an overall elegant bedding. I purchased the pleated satin shams to match the pleated satin 15 inch drop bed skirts and they look lovely on our master bedroom bed. I love the purple satin color and the quality of the product! These add such an elegant touch to a bed. I purchased them to go with the pleated bedskirt I had previously bought here. They are absolutely luxurious both in color and feel. They wash nicely and the color is true to the picture. The shams look expensive and add an elegant touch to our guest room, which is hardly ever used. Our home is on the market and this room lacked interest. Now with a new throw (purchased from overstock.com), bedskirt (also, OS.com), taupe pillow slips and sheets (yes, again, OS.com--OK, so you can't see these) and these shams, it has some pizzazz. I ordered the shams in mocha for my guest room. The color is nicer than what appears on the screen and has more sheen to them. They are a little on the large size but I have made them work. These shams do not seem as though they are very durable so if you are ordering for a bed that is used frequently, they may not hold up. Durability would be the one caveat to my recommending them to a friend. These shams add a pop of eligence to my bed set. Absolutely beautiful shams. The color is wonderful. Just wish they had the rest of the pieces to make a whole set. Can't say enough good about them. They are super! VERY GOOD QUALITY AND THEY LOOK GREAT WITH MY BEDROOM SET. I purchased the gold,,a beautiful color also on the beige side not the bright gold side. The pleats make these,if you like the satin sheen as I do you must get the pleats. They make them classy looking and texture is stunning! These came and I was so surprised for the price. I needed something to break up the single color on the bed. It was a nices surprise. I expected lesser faberic for the price. I would buy these agan and again. tear up quickly when washing otherwise it's okay. Needed shams for a burgundy/gold comforter. Very beautiful and expensive looking. Nice fabric. Love them! Would buy again. If you like satin, these are for you. They work for what I'm using them for. Very pretty and really dress up my guest room. "For your options, they don't have the same options as the pleated satin bed skirt.. is brown the same as the gold pleated bed skirt?" "It says these need to be dry cleaned...? Has anyone tried washing them?" Hello ohappyme, we can appreciate the fact you want a firsthand account of the product. You will receive an email notification every time you get a response. Thank you for shopping with us. "are these returnable if the color isn't right?" Hello dale, you can initiate a return for most new and unopened items within 30 days of delivery for a full refund. * You must return items in new or unused condition with all original materials included with the shipment. We must receive your returned items at our processing facility within 45 days of delivery (see Product-Specific Return Policies for exceptions). We inspect all returned items and award a partial refund for opened or used products. If the return is a result of our error or defective product, we will refund the full cost of the merchandise and shipping charges. If you initiate a return after 30 days, we may issue a partial refund* depending on elapsed time and condition of merchandise. Have a great day. "is this a standard or queen sham?" Hello janeyoung, these shams are offered in standard and king size. The available sizes and colors are listed under the options drop down box. Please let us know if you have additional questions. Thanks for shopping with us.